Time marches on, it is inevitable. No matter what you are applying a time analogy to, it is unstoppable. In baseball, a sometimes overwhelming characteristic is nostalgia. The players were better, the teams were better, the game on the field was better, the hot dogs were better, even some teams that existed were better just because they existed. The Dodgers have been gone from Brooklyn for almost 60 years, but to some degree they still live on. Ebbets Field is long gone and the last remaining Dodgers are starting to pass away, but the Bums of Brooklyn are still alive in the minds of many fans. Todays book takes a look at how the Brooklyn Dodgers were more than just a team that played in a New York neighborhood. The Dodgers were loved by the fans of Brooklyn, possibly more than any other team in all of baseball. They were a pillar of their community and woven so deeply into it that they were almost considered part of the family by the local residents. It is not hard to understand why all these years later they are still the most popular subject pertaining to Brooklyn. David Krell has put together a nice new book that looks at the importance of the Dodgers in Brooklyn and beyond. He starts with giving some background history about the team and its ownership. Starting from the teams birth, you see how they came to call Brooklyn home, and eventually became the tenants of Ebbets Field. You walk through the teams storied history and eventual rise through the National League. You see historical moments that happen in Brooklyn and how the team became a part of the communal fabric. The author shows the reader the financial struggles, management challenges and ownership fights that all helped shape the Brooklyn Dodgers. The part of this book that not many other books have gone as far at looking in-depth at, is the struggles of the real world that helped shape the Dodgers fortunes. Deaths of owners, financial struggles and drastic shifts in the desires of our society have all had a hand in shaping the Brooklyn Dodgers. I have seen other books touch on these subjects, but this one goes a little further in-depth in that analysis. Essentially it is the changes after World War II in our society that effected the Dodgers the most. It wasn’t just O’Malley’s desire for a new stadium that removed the Dodgers from Brooklyn. This book walks the readers through a series of cultural events that paved the way for their exodus to Los Angeles. There are many books out there chronicling the Dodgers existence and each has its own merits. This one as well has its own merits, but it does give the reader a little different angle at which to view the Dodgers time in Brooklyn. Baseball fans and history buffs should check this one out, you will really enjoy it. Teams that have been in existence for a long time have great histories. It is inevitable that through the passage of time some neat things are going to happen and in turn create some great traditions. The Dodgers are one such team that have that long and storied tradition. Being part of the national pastime almost from the beginning, they have created some wonderful memories through the years as well as leaving their mark on the great game we all love. One such tradition was Vero Beach, Florida. The spring training home of the Dodgers for decades, they basically made that town their own little world. Today’s book takes a look at the mark the Dodgers left on that sleepy little town in Florida. Vero Beach in the 1940’s was a sleepy quiet little town in Florida, at least until the Dodgers arrived. Looking to save a buck and avoid segregation issues the Dodgers created their own little complex on a vacated military base. The idea of doing that at the time was unheard of, but does show how the Dodgers liked to not always follow tradition. It allowed for all the players to stay in one location and form a bond as a team, that none of the others had. 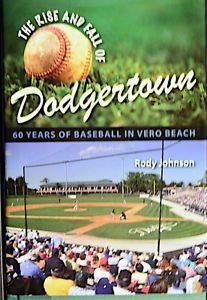 Rody Johnson has written a book that chronicles the entire existence of the Dodgers in Vero Beach. From their first spring at the crude facility through the end when the Dodgers folded their tent and moved to Arizona, you see what became Dodgertown. The book shows you how the Dodgers remodeled and expanded their facility through the years and how the local government was effected both by the Dodgers and other businesses that called Vero home. It also shows the results of the growth of Vero Beach had, because the Dodgers called that town home. Being more than a spring training complex you also get to see the operations the Dodgers had there pretty much year round that helped the economy of the area grow. This is an in-depth book that shows how a team that you really only thought of as a spring training tenant really was a participant in the town all year. If you are not familiar with the Dodgers spring training operations, as I wasn’t, you will be surprised at the magnitude of their facility. It was called Dodgertown for a reason, and this book shows the reader that it really was warranted. Dodgers fans will enjoy it as well as all baseball fans. It shows a cool operation that was a big part of the teams history, and the likes of something we may never see again of this magnitude.